Every grand life is marked by extraordinary moments. At Grand Hyatt Playa del Carmen, our promise is to create more spectacular experiences, both big and small. With passion and enthusiasm, we offer an abundance of options and possibilities, enjoy with your family this wonderful Easter with 20% Off in our Hyatt Standard Rate. All guestrooms include local water, premium Nespresso coffee and assorted selection of teas. A minimum of 2 nights is required. Book Now. Offer valid for reservations made in advance between 02/22/2019 and 05/06/2019 for stays from 04/10/2019 through 05/06/2019 at Grand Hyatt Playa del Carmen Resort. Must request offer code 20EST at time of booking to qualify for discount. A limited number of rooms are allocated to this offer; reservations subject to availability. Offer not valid with groups, conventions, other promotional offers, tour packages or special rate programs. Rate is per room, per night, based on double occupancy and excludes service charges, mandatory resort fees, applicable taxes and other incidental expenses. Additional charges may apply for additional guests or room type upgrades. Promotional blackout periods may apply due to seasonal periods or special events, and normal arrival/departure restrictions apply. Hyatt reserves the right to alter or withdraw this offer at any time without notice. The trademarks Hyatt®, Hyatt Hotels & Resorts®, Park Hyatt®, Grand Hyatt®, Hyatt Regency®, Andaz®, Hyatt Centric®, The Unbound Collection by Hyatt™, Hyatt Place®, Hyatt House®, Hyatt Ziva™, Hyatt Zilara™, World of Hyatt™, Hyatt Residence Club® and related marks are trademarks of Hyatt Corporation or its affiliates. ©2018 Hyatt Corporation. All rights reserved. Explore a sunny getaway in exciting destinations like Riviera Maya, discover and redeem your free night at our spectacular resort with world-class amenities and premium cabanas facing the amazing white sand beach and turquoise waters of the Mexican Caribbean. At Grand Hyatt Playa del Carmen all guestrooms include local water, premium Nespresso coffee and assorted selection of teas. A minimum of 4 nights is required. Book Now. 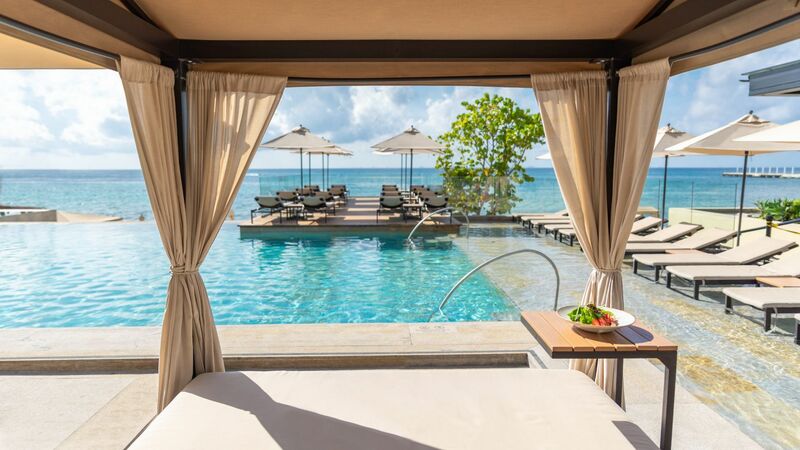 Certificate valid for reservations made in advance between 02/15/2019 and 05/15/2019 at Grand Hyatt Playa del Carmen Resort using offer code 4FREE. Valid for one free night, including associated room taxes, in one standard guestroom (double occupancy) from 02/17/2019 through 12/23/2019. Reservations subject to availability. Original certificate must be presented at time of check-in. Guests arriving without Free Night certificate will be charged one night’s room and tax at the Standard Rate reimbursable within seven (7) days of checkout upon receipt of certificate. Free night will be adjusted at time of checkout. Normal arrival/departure restrictions apply. Limit one free night per stay. Certificate may only be used once and any unused portions of the certificate will be forfeited. Not applicable for any food, beverage, service, casino, resort fees or incidental charges. World of Hyatt® points will not be awarded for the value of this certificate. Guest is responsible for all charges exclusive of this certificate. Additional charges may apply for additional guests or room type upgrades. The availability of certificates at and travel to and from certain destinations may be subject to government approvals, regulations, restrictions or applicable taxes. Not valid with group travel, conventions, other promotional offers or certificates, tour packages or special rate programs. Not redeemable for cash or other substitutions, not replaceable if lost, destroyed, stolen or expired, and void if altered, photocopied, reproduced, copied, purchased, sold or otherwise transferred. Any unauthorized transfer, sale, distribution or reproduction constitutes fraud. Hyatt reserves the right to request a form of security deposit in advance for expenses not covered by this certificate. Certificate will not be extended beyond 12/23/2019 and cannot be exchanged or reissued. User is responsible for and must make any required disclosures regarding any benefits received in connection with this certificate. Nothing compares to the spectacular experience of spending the holidays at Grand Hyatt Playa del Carmen. With breathtaking spaces and phenomenal, creative cuisine, celebrating with us will undoubtedly become your very favorite holiday tradition. Book now and discover the joy of #LivingGrand. Offer valid for reservations made in advance between 02/25/2019 and 05/31/2019 for stays from 12/24/2019 through 01/05/2020 at Grand Hyatt Playa del Carmen Resort. Must request offer code FES19 at time of booking to qualify for discount. A limited number of rooms are allocated to this offer; reservations subject to availability. Offer not valid with groups, conventions, other promotional offers, tour packages or special rate programs. Rate is per room, per night, based on double occupancy and excludes service charges, mandatory resort fees, applicable taxes and other incidental expenses. Additional charges may apply for additional guests or room type upgrades. Promotional blackout periods may apply due to seasonal periods or special events, and normal arrival/departure restrictions apply. Hyatt reserves the right to alter or withdraw this offer at any time without notice. The trademarks Hyatt®, Hyatt Hotels & Resorts®, Park Hyatt®, Grand Hyatt®, Hyatt Regency®, Andaz®, Hyatt Centric®, The Unbound Collection by Hyatt™, Hyatt Place®, Hyatt House®, Hyatt Ziva™, Hyatt Zilara™, World of Hyatt™, Hyatt Residence Club® and related marks are trademarks of Hyatt Corporation or its affiliates. ©2018 Hyatt Corporation. All rights reserved. Experience an all-inclusive culinary journey on the chic beachfront of Grand Hyatt Playa del Carmen while enjoying views of the Caribbean Sea. Discover food and beverages inspired by Mexican and international cuisines with unlimited access to our restaurants, bars and lounges during your stay (including alcoholic beverages). Offer valid for reservations made in advance between 08/01/2018 and 12/22/2019 for stays from 08/09/2018 through 12/23/2019 at Grand Hyatt Playa del Carmen Resort. Which includes: • Unlimited daily Food & Select Beverages at Restaurante La Cocina from 7:00am to 10:00pm per day • Unlimited daily Food & Select Beverages at The Grill at 1 26 from 6:00pm to 11.00pm (previous reservation is mandatory, restrictions apply) per day • Coffee Bar from 6:00am to 6:00pm per day • Unlimited Food & Beverages at el Kiosko Mexicano from 7:00am to 7:00pm per day. Package inclusions are subject to availability and must coincide with guest’s stay at Grand Hyatt Playa del Carmen Resort. No credits may be used towards alcoholic beverages.